By now you have all heard of the allegations of a leaked segment of a tape recorded, private conversation be U. S. President Obama and Israeli Prime Minister Netanyahu. The tape recording was claimed to have been obtained by Israeli Channel One News from an American official. "A reporter for Israel's Channel One claimed a "senior US official" leaked the 35-minute recording to him, which he said took place during a conversation between the two on Sunday." Obama: I demand that Israel agrees to an immediate, unilateral ceasefire and halt all offensive activities - particularly airstrikes. Obama: I believe that Hamas will stop firing rockets - silence will be met with silence. Obama: I repeat and expect Israel to unilaterally stop all its military activity. The pictures of destruction from Gaza distance the world from Israel's position. Netanyahu: Kerry's proposal was completely unrealistic and gives Hamas the military and diplomatic advantage. Obama - interrupts Netanyahu mid-sentence: The ball is in Israel's court - it is obligated to end all military activities. U. S. Ambassador to Israel Dan Shapiro denied the the validity of the discovered tape recording, as did the Israeli Government, in spite of Israeli Channel One's claims. American? Jew? Chicago Bears fan? Here are some questions which I am positive you have already thought of. So, is the tape recording real or not? Who is behind it getting it leaked to the press? Did Prime Minister Netanyahu give the order to have the tape leaked? Is left-wing Channel One waking up to how dangerous Obama is to Israel? Or is it just desperate for a scoop? Now, here are a few more questions which you might have thought of, yet. Did Obama's people have the tape leaked in order to make Netanyahu look bad? Not for his stance against Hamas, but for having appearing to have leaded the tape of a classified conversation? Who leaked the tape, knowing full well that it would be suspected of being a forgery? Does this matter? It does seem that Netanyahu gains from this, showing his constituents that he is "standing up" to U. S. pressure, and that we "need him." Now let's see if he follows through, and really does stand up to the U. S.. . If not, then someone who wants to make Bibi look bad (ie. worse) will seem more likely to have been behind this. Why this was "leaked" now, and not earlier or later? If the tape is fake, then what? Life in Israel, never a dull moment...which, of course, begs the question, is this tape-gate just a distraction? If so, from what? What do "they" want to hide from us this time? What would New York do if it was Attacked by New Jersey? or Giving the Term "Bridge and Tunnel" New Meaning. This video has already made the rounds. But, I just couldn't help it! I had to post it, too! Yeah, I know, I know. Who cares what Hollywood has to say about Israel? Who cares what anyone in America has to say about Israel? Well, as critical as I am of the "Hollywood" and "plastic" mentality, especially having grown up in Southern California, I must admit, that everyone has an opportunity do his or her part, be it Jewish Actress/Writer Joan Rivers (Johnny Carson) or Israeli Actress Gal Gadot (Fast and Furious 6, Justice League). Like it or not, they can reach Jews, and get them to snap out of it, when others cannot. One of the examples Rivers gives regarding the hypothetical attack by New Jersey on New York is the building of tunnels. The fact that they already have, thus the term "bridge and tunnel," I concede is irrelevant to her point. Apparently, Hamas is not just using their children as human shields but as child labor, a more standard trigger to the cry of "human rights violation." Of course, since Arabs are the ones doing it, and not Israel, this gets conveniently ignored. A similarly cavalier approach to child labor and tunnel fatalities damaged the movement’s standing with human-rights groups, despite government assurances dating back to 2008 that it was considering curbs. During a police patrol that the author was permitted to accompany in December 2011, nothing was done to impede the use of children in the tunnels, where, much as in Victorian coal mines, they are prized for their nimble bodies. At least 160 children have been killed in the tunnels, according to Hamas officials. Safety controls on imports appear similarly lax, although the TAC insists that a sixteen-man contingent carries out sporadic spot-checks. Oh, why do I bother?! Is anyone going to listen anyway? Well, that is exactly my point. Sometimes Jews are so blind to the light of the Torah, unable or unwilling to let go of their preconceived, politically-correct, Western progressive notions, even of a minute, in order to be able to listen to logical arguments. Like it or not, extreme situations call for extreme measures. Sometimes you gotta fight Hollywood with Hollywood. Has Tel-Aviv Mayor Ron Huldai Sealed his City's Fate? Following proposal to allow service-providing businesses to operate in Tel Aviv on Saturday, Rabbi Lau hits at Mayor Huldai: 'Cry of Shabbat breaks through walls of my heart'. Tel Aviv's Chief Rabbi Israel Meir Lau slammed City Mayor Ron Huldai for his bid to allow businesses to operate within the city on Saturday, the Jewish day of rest. Out of respect of observant Jews and in accordance with the Jewish character of the State, Tel Aviv, like many other cities in Israel, respects the Shabbat and does not allow businesses or public transportation to operate in the city. The city's chief rabbi sent a letter to the mayor on Monday, nothing that "this is the breaking of the pattern of the city's life since its establishment 105 years ago. Let us consider what is at stake in the decision that stands before you." Well, at least there is one rabbi wiling to stand up for Torah, in the face of "democracy." But, that is a post for another time. This is an old article, but far from the end of the story. Interior Minister Gid'on Sa'ar has since intervened, and has said that he overrule any such local decisions to allow increased categories of businesses to operate on Shabbath. Apparently, the Interior Minister has the power to do so. Nu? Who knew? Yet, I wonder how this would conflict, or rather, collide, with MK Elazar Stern's proposal to allow for restaurants, to obtain Kashruth certification from Israel's Chief Rabbinate, even if open on Shabbath. Since the Jewish Home Party has blocked Stern's proposal, hopefully, we will never have to find out. But, the story does not end there, either. Tel-Aviv business owners were all ready to protest the Interior Ministry's intervention, and open up on Shabbath anyway. However, because of the rockets from Gaza, I wonder just how consistently these businesses have been able to stay open, not only on Shabbath, but during the regular week as well. No, I am suggesting that increased Shabbath violations are behind the City of Tel-Aviv being the primary target of rocket fire. Actually, I remember, during the first Gulf War, this was part of the the reasoning applied by some, as to why Tel-Aviv incurred Scud missile damage, and neighboring B'nei Braq did not. Personally, I believe that Tel-Aviv differentiating between these Yishma'elim (Arabs) and those Yishma'elim is more likely to be connected to Tel-Aviv getting hit 23 years ago, and being under fire again today. But, who can say? I sincerely doubt that Shabbath violations have done anything to aid the situation. I have been suggesting for years that any serious solution of the Gaza problem, or for that matter the Hezbollah problem to the north, would only be taken once rockets reached Tel-Aviv and its "limousine liberal" power base. Well, now we shall see just how deeply in denial Tel-Aviv residents are able to remain. How many will run away, thinning out the Erev Rav? How many of the African "refugees," who have been terrorizing the residents in the southern part of the city, will get sick of the rockets, and finally get up and leave? There are countless reasons why Tel-Aviv has been, and continues to be, a target, not the least of which is the attempt by Yishma'elim to strike a blow to Israel's economic and banking center. YNET, and possibly the City of Tel-Aviv, believes that being respectful to observant Jews is the only legitimate reason to keep [not even all] businesses closed on Shabbath. The Holy One, Blessed Be He, never appears to enter their reasoning. And so, it appears that He has been having to remind them that he is, in fact, present and watching over them. If only they would pay attention and acknowledge Him, if not cry out to Him. Click the link below for this week's Jewish-Israeli Blog Carnival, hosted by Batya at Shiloh Musings! כשכולם מאחורי החיילים בעזה שפועלים במלוא העוצמה (אני מקווה), הטרור ממשיך מפנים. הנה סרטון של ירי זיקוקים על בית יהודי בעיר העתיקה בירושלים. איפה המשטרה? While everyone has been behind the soldiers operating in Gaza at full power (I hope), the terrorist activity has been continuing inside of Israel. Here is a video of fireworks shooting at a Jewish home in the Old City of Jerusalem. Where is the police? הנה עוד סירטון של הצבא המסורס שלנו שלא נותנים לא לטפל וממליץ לברוח. Here is another video of our castrated army, not allowed to deal with the situation, and instead, recommending that they run away. IDF forces which entered a village in order to deal with disturbances within the Hursah Triangle in Mount Hevron, were attacked with Molotov Cocktails. One of them set fire to a jeep, and the convoy withdrew. At the end of the video, there is rejoicing the Arab residents of the village. Jews in America! Get on the Next Plane while you still Can! On Monday, the State Department updated it's warning for Americans traveling to Israel, the West Bank and Gaza due to ongoing hostilities. The Department of State recommends that U.S. citizens consider the deferral of non-essential travel to Israel and the West Bank. I have warned you, Jews in the U. S., that this might happen. Whether due to the cost and availability of fuel or a natural disaster damaging airfield infrastructure and planes, or volcano, like the one in Iceland, preventing planes from landing in Israel or even in neighboring Europe. Yet, all it took to shut down air travel in and out of Israel's main airport, were just a few rockets. After my initial warnings, several years ago, one reader called me "Chicken Little," for declaring that the sky was falling,...in an apocalyptic sense, no less. Well, guess what. The sky does, indeed, appear to be falling, and not just in the form of rockets. Jew-hating riots and violence in France, threats on Jews in Chicago, Jew-hating rhetoric and violence in countless other countries, are only a few pieces of the falling sky. Yet, most of you still just want to say, "Don't Panic!" Sure. It is still possible to get to Israel, right now, by flying into Jordan or Egypt, and the hop on a bus. From Cairo, that bus ride is about 14 hours. And do you really want to risk flying into an Arab country, albeit one which technically has a peace agreement in place with Israel? Such peace agreements have not prevented missiles from being fired into Eilat, at the southern tip of Israel, nor attacks on Israeli tourists in the Sinai Desert. Nevertheless, such agreements exist,...on paper anyway. It is also possible to fly into Cyprus, and perhaps other Mediterranean counties, and then hop on a boat to Haifa. I will assume that you would prefer to avoid the southern port of Ashdod, do to rocket fire from Gaza, the same reason why flights to Israel from the U. S. were cancelled in the first place. But, you are still not even thinking about packing your bags, and getting on the next possible flight, are you? Nope. You just think that this will pass, and everything will be back to normal. And, quite possibly, it will. Will Jews in America Finally See the Writing on the Wall? You know what’s interesting? How we always hear the shrieking whines of America’s Muslims about non-existent “Islamophobia,” while no one says a word about their very real and dangerous Jewphobia (and I should know since I’ve been the recipient of many Muslim Jew-hating death threats, for which only two people have been prosecuted–both of ‘em sent to federal prison). I mean, do you think anyone but Muslims put out these leaflets threatening Chicago Jews? If ya do, I have some land in the Sahara to sell you (and some flattened tunnels in Gaza in a package deal). And, if 9/11 and Fort Hood and the Undiebomber and the Times Square Bomber, and every other attack that was tried on our shores isn’t enough to convince you, here’s a tip: they ain’t just goin’ after da Jews. You’re a target, too. What are you gonna do about it? Well, I do not know what Americans should do about it. But, Jews in America have only one solution, and that is to read the writing on the wall, and then pack your bags, get on the plane, and move to your only Although I am not routing for Yishma'el (Arabs/Muslims) to rise up and destroy the U. S. -- Esau (Rome/The West) and Yishma'el do not need any of my help to destroy each other -- I would not mind seeing the U. S. being taken down a peg, for its poor treatment of Israel. As Schlussel says, Americans are a target. Even though many still appear to be in denial about it. Poor treatment of Israel, some of you ask? Friend of Israel, some of you say? Friends do not tell friends how to defend themselves, or in this case, how they should not defend themselves, and just lie down an take it, like the masochists we are. Friends do not expect friends to risk the lives of their children, in order to save the lives of their enemies' children, being used as human shields. Friends do not fund the enemies of their friends, directly or otherwise. Friends do not force friends to fight wars for them, while publicly demonizing them for doing so. No doubt the U. S. would be very happy to see Hamas wiped out,...as would several Arabs nations. Yet, who has to lose their lives in a war which Israel is not allow to execute properly? Two "nice Jewish boys" who grew up in the U. S., one from "The Valley" and one from an Israeli family in a small town in South Texas, not to mention the other "Jewish kids," who grew up in Israel. 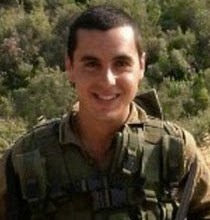 Naftali Frenkel hy"d, who was recently abducted and killed by Arab terrorists near Hevron, was a U. S. citizen, and much to do was made of this fact. But, to know avail. The U. S. government did not care, nor does care about its Jooz, save for its well-behaved "Court Jews." But, even then, if any ever became too supportive of Israel, let alone move here, become a citizen, and fight in its army. No, Jews in an America are only tolerated if they are nebachy Woody Allen types, or fully assimilated Jews making fabulous movies about intermarried couples living happily ever after and/or with incredible special effects which help to keep the American populace numbed-out. The U. S. is Israel's friend, right? So, then why should it matter, American Jew, Jewish American, American Israeli? We're all on the same side, right? Sharon with Peres looking over his shoulder or Netanyahu with Peres looking over his shoulder, it doesn't matter. The Israeli Government is nothing less that a puppet of the U. S., no matter who is [apparently] running the show, not the other way around, like "Zionist Conspiracy" theorists would have you believe. Barack Hussein Obama who bows to the King of Saudi Arabia, and doesn't care about anyone's security, not Israel's nor his own country's. George W. Bush who invites the Saudis to hang out with him in Crawford, TX, and who is completely incapable of hiding his thirst for crude. William Jefferson Clinton who rammed the and who pushed us to give away 93% of Judea and Samaria, which for any of you who have ever read the Bible should know that The Almighty granted to us, and not to anyone else,...not after the poor slobs, the Canaanites, who were destined for failure. I wish I could blame him for the Oslo "Death" Accords, but our politicians and sneaky "Justice System" happily take all of the credit for them. They are ALL the same: Americans who concern themselves with the interests of America (well, except for Obama). And why shouldn't they? After all, it appears that Israel is the only country int he world which does NOT seek to further its own interests. Still, even if you could refute all of the above, and prove to me that all American presidents and governments are "holy" allies of Israel, it would be irrelevant. America is one of the lands of our exile; it is not our true home. Now, are you ready for the clincher? Probably not, but I'll tell you anyway. Exile is a punishment. That's right, a punishment. Every second that the Jewish People was not residing in their Divinely promised Homeland, it was an embarrassment. The great successes Jews have made in not only fitting into mainstream, American society, but making incredible contributions to that society, do not change the fact that exile is a punishment. Schlussel points out, "they ain’t just goin’ after da Jews." I agree with 90 to 95% of whatever Debbie Schlussel writes, and this issue is no exception. She's right. Yet, Steinberg and Carmieli were killed during the performance of the misswah (Torah commandment) of protecting, and in my opinion, fighting in a milhemeth misswah (obligatory war). Frenkel was killed simply because he was a Jew. None of them were killed because they were Americans. Some of you will be moved by this, by the war they were fighting, and by double standards weighed against Jews. You will wake up from your assimilated, numbed-out state (most of it, anyway), pack your bags, and get on a plane to Israel. Yet others of you will be frightened by the situation, and the deaths of clean cut "American" boys in Israel, clutch onto your creature comforts even harder, cancel your vacation to Israel, or your child's year of study there. How many of you will be able to see the writing on the wall? How many of you will will remain stuck in Egypt Edom, due to your assimilation, your "success" at being a fully accepted American? How many of you will remain covered in the darkness? *Our Sages, the Kol HaTor among them, teach us of the parallels between our exile in Egypt and our current exile in Edom, including the parallels between their respective conclusions. MK Elazar Stern's "Kosher Style" Restaurants! You may recall that MK Stern as Gen. Stern, Head of IDF Personnel, was responsible for push behind the demanding that soldiers violate halakha. Oh, don't get me wrong. I am certain that Stern had a "rabbi" to back him up with some back flips on these issues, bending over backwards, as it were, to find backing for his agenda. So, what was the latest MK Stern to pull out of his sleeve? According to MK Elazar Stern’s bill, the only requirement for a restaurant or other business to get kosher certification would be to serve kosher food. Unlike Israeli hotels and soup kitchens open on Shabbath, money will be exchanged at these "kosher" restaurants. Even those controversially kosher doughnut shops in the U. S. have set up a system in which its ownership transfers fully to a non-Jewish partner during Shabbath, major holidays, and all of Passover. I know that in at least one such shop, a bagel shop, the policy was never to cook anything on Shabbath, saving for warning up something already cooked in a microwave by a non-Jew. The precautions taken by these American eateries make them look "ultra-Orthodox" compared to MK Stern's "kosher" restaurants. This new system of Open-On-Shabbos-Kosher restaurants is meant to help business owners financially The spiritual conditional of business owners and their customers more than just falls by the waist side; it gets thrown out the window. To put it bluntly, MK Stern makes it easier for business owners and their customers to violate Shabbath, yarmulke on his head not withstanding. A certain descriptive noun comes to mind in relation to MK Stern's halakhic (Jewish legal) status. However, I would not want to risk violating Israeli law by "calling a government official a name." So, I will have to let you look this one up on your own. Might I suggest the Laws of Teshuvah of the Ramba"m... Oh, I don't know... maybe chapter three? Already we have seen the government intervene in matters of halakhah, mainly through its "legislate from the bench" extraordinaire, Supreme Court. The Supreme Court has involved itself with kashruth, Shabbath, not to mention countless other issues, with many mamlakhti (diehard State loyalist) "rabbis" insist are not halakhic matters, but rather political in nature. Do not get me started! On the other hand, the entire Chief Rabbinate system, both on a state level, and on the military level, is nonoperational, a leftover from our lovely British and Turkish oppressors. The Chief Rabbinate's silence on gross violations of the Torah by the Israeli Government is deafening, in and of itself. In my opinion, it currently serves us only as a necessary evil to prevent the majority of the Jewish public from ingesting non-kosher food items, from marrying individuals who are prohibited to them, and to maintain proper divorce actions, to prevent mamzeruth, if nothing else. My issue is not so much with Stern, as it is with the un-Jewish system of government of the Land of Israel, not the least of which is the lack of properly appointed, independent, Torah judicial body, ie. Sanhedrin. More and more, I have been successfully convinced that the State of Israel is only Jewish based on cosmetics and window dressing, and the fact that a great many Jews happen to reside within it. Fortunately, we may not have to worry about the "Stern Kosher Style" restaurant coming to a theater city near you,...at least not in the immediate future. Now, if an MK who identifies himself at "religious" believes that the Bayit Yehudi (Jewish Home) party is in the least bit extreme, and for opposing his "Kosher Style" restaurant scheme, then we have a much bigger problem in the Jewish education department than any of us initially thought. Is this good reason? No. It is not. Yet, MK Stern, a graduate of the prestigious Netiv Meir Yeshiva in Jerusalem, finds it to be "extreme." Sure, I understand that Bayit Yehudi is trying to reach secular Jews with their message, not to mention those "religious" Jews deluded into thinking that democracy has anything to do with a Torah way of life. Nevertheless, would it have killed it to protect Shabbath observance in its statement of opposition? But, wait! MK Stern appears to redeem himself! Or rather he knows better than to take on the Torah head on, and attempts to chip away at one piece of the Torah, while appearing to support a different piece. a new law has been proposed, and has already passed its first reading in Knesset. 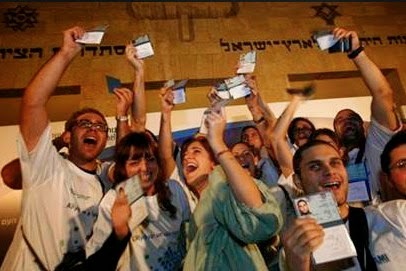 The new law will add a person's Hebrew birthday to his driver's license, rather than it just bearing the "English date"..
MK Elazar Stern (Hatnua) has proposed this law because recent studies have shown that over 50% of people in Israel do not know the Hebrew dates or even their Hebrew birthday. Sounds like a great idea, right? MK Stern should be praised, right? Wrong! ...Stern said that he believes Israel must remain both Jewish and democratic in character, but not at the expense of minorities.. the Hebrew date is an important part of this, but anybody who does not want it to appear on his or her license, for whatever reason, will be allowed to say so and the Hebrew date will not be added to that license. Stern ruins his new proposal, as he as ruined everything in his path, by his incessant attempts to Hellenize the Torah. MK Stern would do well to review the authentic story behind the creation of the holiday of Hanukkah, not to mention the entire history of the Jewish People's battles against assimilation. Unfortunately, I do believe that it would do him, nor the Jewish People, one darn bit of good. I’ve waited for a week or so to comment on the latest (and inevitable) Israeli-Arab conflict to see if anything different was going to happen compared to the last time Israel had to go after Hamas for firing rockets into Israel. Apparently, it’s going to be more of the same—a truce, brokered by Egypt (the hypocrite), and Israel always stopping short of actually rooting out Hamas and all its armaments. There are many complexities to explain this week, but the bottom line is that for the good of both Palestinian and Israeli civilians, Hamas has to be destroyed and Gaza has to be re-occupied—and not because Israel’s globalist puppet government is good or benevolent, but simply because, of the few alternatives available, that’s the only option that historically has given the innocent on both sides the chance to work and live normal lives without constant violence. It’s not real independence for the Palestinians, but as long as they have no power to elect peaceful leaders that’s the best thing they are going to get. I will assume that Skousen has more "inside" sources of information than I. But, I am not sure how relevant that is, since I fully agree with him on the less than popular claims regarding "Israel’s globalist puppet government." That is a pretty good description. My only question is "Where are the orders originating exactly?" Perhaps Skousen has the answer, or at least a theory, regarding this. I also believe that Skousen hits the mark with each of the other points he makes in this brief, with one exception. Unless Skousen is suggesting that the election of Hamas was set up, rigged, or otherwise ..., which I would agree is certainly possible, I must then insist that the "Palestinian People" did freely choose Hamas in its last elections, knowing full well who they are. Yes, as far as I know, Hamas does use some of its funds from Iran and elsewhere to build hospitals and midrassas (Muslim religious schools), and provides the people with just enough food, in order to have the strength to come out en masse to protests and move around enough to adjust for Hamas's needs for human shields. However, the "Palestinian People" also are fully aware that Hamas is hellbent on Israel's destruction. And while we are on the topic of the "Palestinian People...."
For those of you who believe in the myth that Fatah is "better" than Hamas, let us not forget Yassar Arafat's (Fatah) Palestinian Liberation Organization's [PLO] insignia (left). It included a map of his vision of "Palestine," which was not just Judea, Samaria, and Gaza, but all of Israel as well. The Golan Heights were not included, as he had the intention to turn this area over to Syria, once Israel had been wiped off of the map. And what do you know? 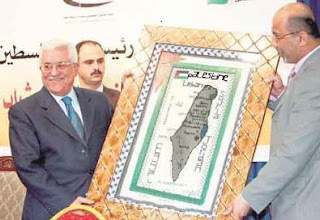 Here is Palestinian Authority President Mahmoud Abbas (Fatah), holding up yet another map of "Palestine." (below - right) Regardless of the source of this particular map, the flag and title at its top says it all. The only real difference between Fatah and Hamas is that Hamas is the more patient of the two. Now, back to Gaza, whether following their government due to ideology or "sheepledom," the residents of Gaza are most certainly culpable. Haveil Havalim Jewish-Israeli Blog Round-Up, Parashath Matoth 5774: What War With Gaza? Founded by Soccer Dad, Haveil Havalim is a carnival of Jewish blogs -- a weekly collection of Jewish and Israeli blog highlights, tidbits and points of interest collected from blogs all around the world. It's hosted by different bloggers each week, jointly coordinated through our Facebook Group.The term 'Haveil Havalim,' which means"Vanity of Vanities," is from Qoheleth, (Ecclesiastes) which was written by King Solomon. King Solomon built the Holy Temple in Jerusalem and later on got all bogged down in materialism and other 'excesses' and realized that it was nothing but 'hevel,' or in English,'vanity.' Submissions may be may through our on-line submission form on BlogCarnival.com, which requires you to log-in first. Rabbi David Bar-Hayim teaches us about Yishmael: Pere Adam - Uncivilized and Lawless. Avraham Ben Yehuda writes about Arab War Tactics and Human Sacrifice in the Bible. Daniel Pinner writes on Parshat Mattot. Dov Bar-Leib at End Of Days presents The Turtledove War: The Process of Kolot in Year 6, Part 2. 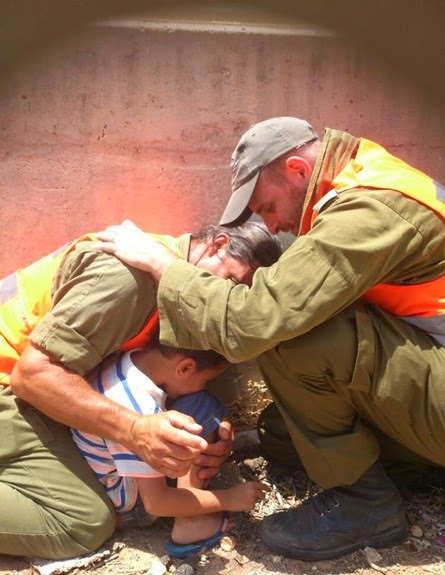 IDF Soldiers protect a 4 1/2 year old boy during rockets warning sirens in Rehovoth. ...Make sure to read his commentary. Yitzchok Meir, founder of the Jewish Unity Project, video blogs his trip to the south, taking only his guitar, humous, and some friends. In American terms, Yitzchok Meir is Israel's one-man equivalent of the USO, and he is on a mission to win the war against sinath hinam (baseless hatred)! Tomer Devorah informs us of what is really going on behind reports of the mainstream news media in Thinking The Unthinkable. Yeranen Yaakov writes on Rav Shmuel Eliyahu: "Thank Hashem for Miracles" and Explains Every חמס in Tehillim. Tzvi Szajnbrun presents an interesting side to the IDF's current military Operation - Operation - "Tzuk Eitan" (Protective Edge). Sara Layah Shomron, posting at Shiloh Musings, writes about Operation Protective Edge Your Way Around. This Anonymous blogger begs Israeli parents Tell your Children to Come Home Before They are Sent Home in a Casket. 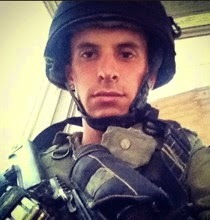 Speaking of the IDF, I report on Amit the Soldier and the Deafening Silence. Donny Fuchs reminds us of the time when Wars were Wars and Men were Men. The Jewish Fist asks dares to re-examine the popular question making the rounds, "Is Revenge Jewish?" He also brings us two audio posts, Loony Jews With Kipot and Obscene Defined. See what Ariel Ben Yochanan experienced at Ben-Gurion Airport Under Attack. He also asks, What Are You? A Soldier of the State or a Jew, a Soldier of Hashem? and questions IDF military strategy in IDF Calls on 100,000 Gazans to Evacuate. Sultan Knish chimes in with Winning the Moral High Ground is a Loser's Game. Batya at Shiloh Musings has been Listening To Ordinary Israelis. She also tells us that Davka This Year, They had Planned on Coming to Israel. and writes about The Problems of Being a Jewish Mother Patriot. Tomer Devorah asks What If It's All Distraction? Ricki's Mom at Beneath The Wings shares with us first hand hand experience in A Taste of Life Under the Rockets. Tzivia at Adventures In AliyahLand asks Know Where It's Dangerous? Yocheved at It's My Crisis and I'll Cry if I Need To brings us Empowering Myself and Other People to Cope with War. One of the boys recently abducted and killed by Arabs, Naftali Frankel hy"d, was an American citizen. I ask So What? Meanwhile, Is Israel a Fashion Powerhouse? Check it out on Me-Ander by Batya. Ricki's Mom at Beneath The Wings brings us a look at how we enjoy our grown children learning that we weren’t such bad parents after all in Like His Father, My Son. Yeranen Yaakov reports on Turkish Prime Minister Erogan's Attack on Turkey's Chief Rabbi. Read this piece, and you will wonder like I have if things are really going down this time! Shmuel Sackett follows this idea up with Don't Cancel Your Trip to Israel. Debbie Schlussel reports that JetBlue Removes Pro-Israel Jews After Palestinian Complains. She also reports on the worldwide, anti-Jew violence in Kristnacht 2014, and on the death threat against her! That's right! Check it out in Jew-Hatred Tweet of the Day. Tzivia at Adventures In AliyahLand asks When is the Right Time to Make Aliyah? 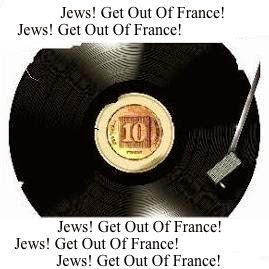 It's Broken Record Time: Jews! Get Out Of France! Previously I posted a video from Rivky Stein regarding her marriage and request for a get from her husband Yoel Weiss. To be fair here is a post from Yoel Weiss, published at Daas Torah. I was sent the following view of the "war" and current security situation in Israel, for me to post anonymously. What do you think? Does the Israeli Government really care about your children serving in the Israeli Defense Forces [IDF]? Does the Israeli Government care more about how it looks in the eyes of the "international community" than its own constituents and soldiers? Please leave your thoughts as comments below. The current mini war is a means for Pipi to strengthen himself in the polls and not to restore and false sense of security to Jews. The state of Israel directly funds and arms the Hamas and Fatah. The IDF is one of the most Inhumane armies in the world. Regardless of their motivation for enlisting and going in to battle, this current mini-war is a farce and will accomplish nothing. The Hamas will remain in power, (and if not them it will be Fatah which is the same) the rocket supplies will soon be replenished, and the tunnels will continue to be dug faster than they can be destroyed. There is no reason for your friends or children to have their lives wasted in this politically motivated mini-war so Pipi can gain some popularity in the polls. The operation will not store or restore any security. There hasn't been any security for the last 65 years. Albeit the recent rocket attacks are now reaching the center of Israel but this is what the residence of the south deal with on a daily basis and will continue to deal with on a daily basis, long after this operation is over. Suppressing the rocket attacks and preventing terror can be done using unmanned aircraft without risking your children's lives! Israel is obligated by law to transfer funds to the Gaza Strip for humanitarian aid through the Bank of Israel. But is it legal to put money into the hands of those who kill our children? Isn't it ironic that the same state that funds these terrorists and buys them their weapons is now going to risk your child's life to “fight” them? Isn't that appalling? How are you not outraged?! The IDF likes to boast on facebook and twitter, pictures of Israeli soldiers putting themselves in danger in order to save Arab children. They boast about how they called off airstrikes, thus, allowing rockets to be launched into the heart of Israel, simply because there were “civillians” in the vicinity of the rocket launching pad. They believe that it is humane to risk the lives of its own soldiers and civillians in order to spare lives of the enemy “civillian” population so they can gain popularity in the eyes of the world, thinking they will love us for being cruel to ourselves.... Is that the type of army you want your children serving in? Are you willing to risk your sons' lives so the IDF can “tweet” about how he died being “humane”?! It is not my intention to go in to a lengthy halachic discussion regarding the countless issurim for serving in the army, maybe in another post. I would like to say that serving in an army that razes synagogues, Jewish homes, beats and torments Jews, and risks the lives of other Jews in order to look good in the eyes of the world is neither moral or halachicly appropriate. Simply put it is a Chilul Hashem! וואלה! צוער דתי הודח מקורס קצינים בגלל "קיצוניות דתית"
The incident above occurred two months ago. As far as I could tell, Christian supported JPost.com and Christian supported Arutz 7 were silent on this incident. But, like I said. Perhaps I missed the reports, and it was buried somewhere. Arutz 7's Hebrew weekly b'Sheva did have a short piece on it, with comments from rabbis from Amit's influential, Mamlakhti (diehard State loyalist) yeshivah B'nei David in the moderate, Shomron town of Eli. But this did not surprise me, as Mamlakhti rabbis have long expressed concerns over the dangers of Christians operating in Israel, and the influence they have been acquiring. You can imagine my disappointment when I attempted to start an on-line "Support Amit" campaign. Even those sympathetic to Amit's situation felt they already had their hands full, putting forth their efforts for the sake of Am Yisra'el and Eretz Yisra'el in other directions. In contrast, an amazing campaign set up to support David, a soldier who faced disciplinary action for daring to defend himself, appears to have been making the IDF itself nervous. The IDF has even taken in soldiers for questioning, soldiers who failed to cover the faces in other on-line campaigns. Meanwhile, "messianic" websites ysh"w have been abound with decries of victory for their cause to spread their avodah zarah in Israel. So why have I come up against nothing but brick walls when investigating the worth and effectiveness of such a campaign for a soldier accused of "religious extremism?" Is it that the IDF is well-aware of the Christian money pouring into Israel, and does not want to rock the boat? Has the IDF been receiving orders from higher up? After all, just fired Deputy Defense Minister Danny Danon (Likud) has connections to American Christian communities, and as Chair of the World Likud has been involved with encouraging Christians to settle in Israel. Even though this is forbidden under Jewish Law, even temporarily. Expect Danon to find a way to turn his firing into an advantage, when running for Likud leadership in the next primaries. Furthermore, the officer candidate giving the "lecture" above is far from the only aberration of his kind to be found in the IDF. I periodically receive reports of such soldiers embedded with the IDF. There are a few reasons to find such misguided Jews, and not-Jews, in the IDF, even in officer candidates' courses. Some American Christians volunteer to serve in the IDF as way to boost their chances for receiving Israeli citizenship. As disgusting as it sounds, such individuals have been granted citizenship. Other soldiers are goyim from the former Soviet Union searching for their personal niche in Israel, as if they should have been allowed to immigrate in the first place. Still others are disenfranchised, Jews, often immigrants searching for something, but do not know exactly what, belonging perhaps. I wonder what would have happened if an officer candidate wanted to give an anti-messianic/anti-Christian lecture? What if the "messianic" refused to participate? What if an Arab Christian refused? Who would have been disciplined then? Naftali Frankel hy"d was an American Citizen. So What? TEL AVIV – U.S. Secretary of State John Kerry’s condemnation Sunday of the kidnapping of three Israeli teenagers omits the fact that one of those abducted is a U.S. citizen. Yeah, I know what you're going to say. Not enough time has past to post this kind of piece. Sorry, but time is of the essence. If you haven't noticed, rockets from Gaza can now reach much farther into Israel than the last time there were barrages focusing on just the south.Sirens and exploding rockets have both been heard as far away from Gaza as Jerusalem, Hadera, Zikhron Ya'aqov and Haifa. Apparently the rockets are not yet filled with explosives to capacity. If appears that Hamas is focusing on showing off the distance their rockets can now reach, much farther than only a few years ago. The difference between most American Jews in Israel and their Yemenite counterparts appears to be that Yemenite Jews, and for that matter, Tunisian, Iraqi, and Persian (Iranian) Jews, are well aware at how ridiculous it is to look to the governments of the lands of their exile to rescue them. Also, unlike American Jews, these Jews are well aware that the governments of their exile despise them. Jews are still getting killed in Yemen, and their daughters are still potential targets for kidnapping into marriage, thus the custom there of betrothing and marrying them off at young ages in contrast to contemporary Western standards. Various ethnic groups in Iraq have been successfully obtaining compensation from the current Iraqi regime for properties lost during the reign of Saddam Hussein. All ethnic groups have been successful, except for the Jews. Jews have been regularly set up, and punished, as "spies" for Israel in Iran. Jews, and others, may not leave the country with more than like $500. More than one member of a family leaving at the same time is complicated at best, and rare. Arrangements to move to Israel, must be made by sending communications to Turkey, or another Muslim country, where Jews there act as relay stations with the Jewish Agency in Israel or the U. S. Open contact with Israel can be fatal. But, it has been trickier for American Jews. The weapons of the U. S. government used against Israel have included only pen and paper, the news media, and its financial resources and influence. The weapons of the U. S. Government against Israel have not included swords, guns, drones, nor bombers in the air,...yet. We were all born with the specific challenges inherent in the lands of our exiles. Jews born in Yishma'elite/Muslim countries may have had a more difficult time of it regarding their physical safety. Yet, this has always made it easy for them to know the reality of the punishment of exile. American Jews have been faced with the spiritual challenges of assimilation, intermarriage, pseudo-conversions, quasi-Judaism, etc., and many have failed to through them, believing them to be the answers as to how to regard the modern Western world which encircles us. The lack of physical threats for the most part during recent times has also contributed to the "forgetting" that exile is a punishment; living outside of our only true Homeland is a punishment. Meeting the financial and emotional challenges of the exile with financial success and major contributions to the benefit of American society perhaps have blinded us to the importance of looking toward residing in the Land of Israel, as our ultimate objective. Jews raised in Arabs countries may have incurred horrible physical suffering and torture over the years. However, in the long run, this may have been a blessing. Whereas the experiences of Americans have blinded them to the reality that American is not our "friend." Exile is still a punishment, no matter how many cars you own, nor how many bedrooms your house has, nor how much "respect" you believe you garner from your colleagues in your high-paying, prestigious professions. Many Americans are so blind that they still proudly identify themselves as American Jews, even though they live here, in Israel! "American" is not an ethnicity with rich customs like Yemenite, Iraqi, Persian, or even Lithuanian, Russian and Yekke! America is a nation, founded only 238 years ago, an that is all it is. Incidentally, it was founded on 17 Tammuz. What does that tell you? Granted it is a "land of opportunity," with various freedoms unavailable in most other countries around the world. Or, at least it was. No wonder why Americans have such a hard time adjusting to life in Israel. There bodies are here, but their hearts are still across the Atlantic Ocean! Dare I bring up the Holocaust's influence on Western Jews? After having been broken physically, undoubtedly worse in some ways than our brothers and sisters to the south and to the east, we have such short memories! The world has not changed its mind about the Jews. Rather, we are in denial of this, or pretend not to care, even when we really do. The fact is that John Kerry was sending American Jews us a message, and in particular American Jews residing in Israel. You are not really Americans, no matter how much you contributed to America and its society, since before the Revolutionary War,...and you never have been. It seems to me that this message, whether a conscious or unconscious omission, may have been sent to us from higher up, and Secretary of State John Kerry was just a tool of delivery. After all, it would not be the first time He has used a non-Jew or Jew of questionable status as messenger. Just look at all of the "piece negotiations" (spelling on purpose) which have failed miserably due the Arabs rejecting them. How many more messages will He have to send to us before we finally get it through our thick skulls that we are a people, separate and distinct from other peoples. We stand alone, with only the Holy One, Blessed Be He beside us, and certainly not the U. S.
Many of you may wonder why I am writing about this, since I have often stated how little I care about what takes place with the U. S., and especially since I renounced my U. S. citizenship a few months ago. This issue caught me attention, as a dot which could potentially be connected to the dots represented by other events around the world. Just because I generally do not care about what takes place with the U. S., does not mean that we cannot still glean crucial information from what takes place there, from the way the U. S. government operates, and from the quality of the response from the American people,...or lack thereof. It can also be helpful to keep up to date on events in the U. S., in order to bring them to the attention of all those Jews still imprisoned there spiritually, or in one way or another. Moderate and apparently temporary, levels of fear have repeatedly failed in influencing Jews to leave their current exile. Memories are too short and too occupied with the daily grind, in order to connect the dots. Yet if I can wake up even Jew to the face that the U. S. is the land of his exile, and succeed in reminding him that exile is, in fact, a punishment, then this was all worth it. וכל המקיים נפש אחת, מעלים עליו כאילו קיים עולם מלא. Texas Gov. Rick Perry repeated an accusation that undocumented children coming to the U.S. from Latin American countries might be a result of “ulterior motives” from President Obama. “This president, I will suggest, is either totally and absolutely either inept, or making some decisions that are not in the best interests of American citizens,” Perry said during that interview with Fox News. ...“Last year, we had to cancel more than 200 very effective engagement activities and numerous multilateral exercises,” Kelly said, explaining that a full 74 percent of “actionable illicit trafficking events” simply go unanswered, because he doesn’t have the funds or resources to do anything about it. I wonder if the U. S. is being punished "middah ka'neged middah," (measure for measure). While the U. S. pushes Israel in the direction of weakening and irrelevant borders, fading Jewish identity, and ultimate destruction from Arabs both inside and outside of Israel, the U. S. appears to be incurring the very results it wants to impose on us. The southern border of the U. S. is becoming irrelevant. In addition to the transformation of American society by facilitating the introduction of millions of undocumented workers illegal aliens, greater and greater dangers now appear to be passing through, as mentioned above. Part of this is simply the U. S. Government's complicity in the globalist agenda, attempting to pull the nationalist carpet out from under the feat of the American people, some of whom do not intend to take this lying down. (WMD) Radio host Rush Limbaugh led his show Tuesday with stories about the successful pushback against the illegals going on across America. “Here’s what you do not know,” he said. “There are towns all over America standing up to this invasion, just like they did in Murrieta, California. You’re not hearing about it, however, and I am here to tell you why you’re not hearing about it. Westminster, Maryland, is a town standing up to it, just like Murrieta, California, did. Oracle, Arizona, is standing up to it. These Americans will no doubt be demonized as racists, in some distorted way, just like Israelis have been demonized. The U. S. Government's treatment of Israel should not be underestimated as having influence on the consequences of it actions. Its blatant hypocrisy can only serve to make things worse. Here are some examples. The belief that the American acquisition of various parts of the southwestern U. S. was less than "kosher," has been gaining prominence. Won fairly in a war? Through final settlement negotiations? The addition of the California Republic to the U. S., how consensual was that? That's right. Many do not know this historical fact, but California was an independent state before joining the Union. Just ask Native Americans living on reservations about "Land For Peace." Some have suffered health problems such as obesity, due to the U. S. Government's gracious food subsides, as in foods running contrary to their dietary needs. I could on for quite some time regarding the damnable treatment by the U. S. government toward those who were residing in North America long before them. And what about the "encouragement" of the Queen of Hawaii to relinquish her islands to the U. S. Government? When I was a kid, like every American elementary school student, I learned about the "purchase" of the island of Manhattan from the local Native American tribe for $24 in goods (est. $1,000 today). But, since the Dutch did it, and then the British acquired it from then, and then was included in the lands won by the nacent U. S. A. from the British, that makes it ok.
And, who does not remember the phrase "Manifest Destiny," already a developing concept before America's Revolutionary War? Who else remembers these propaganda educational shorts from the 1970's? The participation of the U. S. government in the globalist agenda will surely backfire, in one way or another. Having dared to tell Israel what it should or should not do with the our Divinely granted Land will only make things worse for them. The U. S. will eventually die. Let's hope that the Jews finally wake up to this fact, and pass the current test presented to them: Coming back to their only true home, in spite of the rockets, in spite of the potential, future rockets with more explosive power, potential future rockets from the North, threats from Iran, and now the self-proclaimed Islamic State of Iraq and Syria [ISIS]. Mes Frères, Retournez-vous à votre maison, Israël! But clashes erupted at the end of the march on Bastille Square, with people throwing projectiles onto a cordon of police who responded with tear gas. The unrest was continuing early Sunday evening. Media reports said that hundreds of Jews were trapped inside a synagogue in the area and police units were sent to rescue them. Like an intifada? Perhaps. Try siege. It is much more specific. During this very month, the Fourth Month or "Tammuz," almost 2,600 years ago, and then again 1,934 years ago, the ancient city of Jerusalem lay under siege, first by the Babylonians, then by the Romans. Nine years ago, in the next month of "Av," the Expulsion of Jews ended with last stand by Rabbis Dov Lior from Hevron-Qeriyath Arba and Zalman Melamed from Beth-El, along with many young Jewish men and women, on the roof of the synagogue in the now Judenrein town of K'far Darom in Southern Gaza. Interestingly enough, tomorrow commemorates one of Europe's greatest and most successful sieges, Bastille Day. If you are going to be subject to a siege -- and do not think that this will be that last one, nor that the police will be infallible with their rescue efforts -- then you really should be in only true, Homeland, the Land of Israel, and where you will actually have a chance at survival. After killings and beatings and assorted threats, it is time to take the hint already. Just pack your bags, and get on the plane! Update: Maybe you are getting the message! Parshat Pinchans Haveil Havalim Is Up! Rabbi Eliyokim Levanon: Lost In Translation?